It would be tragic to discover all God wants to do in you through his grace yet never accept it in your life. ”For the law was given through Moses, but God’s unfailing love and faithfulness came through Jesus Christ” (John 1:17 NLT). In yesterday’s devotional we looked at 10 great benefits of God’s grace in our lives. 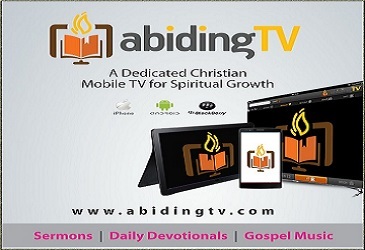 As you read those benefits, you may have wondered how you can receive that grace in your life. It would be tragic to discover all God wants to do in you through his grace yet never accept it in your life. So how do you receive the grace of God in your life? There isn’t a 23-part answer to the question. You don’t need to go to seminary to discover it. The Bible gives an easy, three-word answer for how you receive the grace of God: by trusting Christ. The Bible says in John 1:17, “For the law was given through Moses, but God’s unfailing love and faithfulness came through Jesus Christ” (NLT). 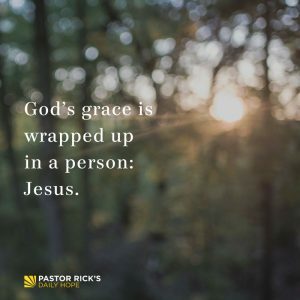 God’s grace is entirely wrapped up in a person: Jesus. You can’t get it through religion or ritual. You can’t get it by following the rules. You get it through Jesus. God’s grace is free. You simply need to accept it. But let me be very clear: God’s grace is not cheap. It cost Jesus his life. Grace is the most expensive commodity there is. Jesus died on the cross to pay for it. It paid the penalty for sin. Someone had to pay for the penalty for our sin. If you have a relationship with Jesus, he has taken care of your penalty. It broke the power of sin. Jesus’ death on the cross gives us the power to change the habits, hurts, and hang-ups that derail our lives. The presence of sin will be obliterated. One day all who follow Jesus will go to heaven, where there won’t be any sin. The costly grace God offers will change everything about your life. You just have to accept it! How does your life demonstration thankfulness to God for his grace? If the grace of God is relatively easy to understand and its benefits are so amazing, why do you think so many people never accept it? How can you share the message of God’s grace with a friend or family member this week?